Are you happy with your dirt, sand or concrete patio or porch in the front & back of your home? Would it be a lot nicer with some gorgeous beautiful outdoor tile & stone? It’s Florida; Embrace the tile patio or tile porch. Not only is it fashionable with the Home Owners Associations, but its gorgeous too. 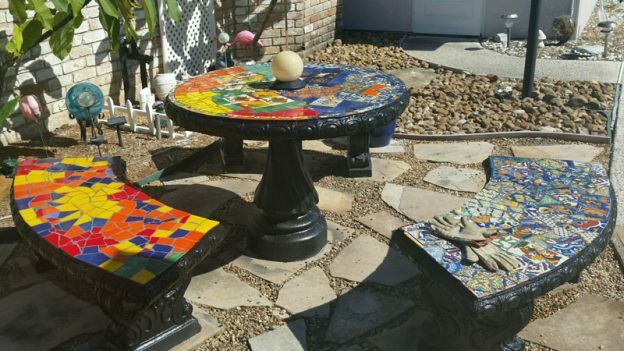 Do you have a bird bath or birdhouse outside near your patio or porch that you rarely see? You see the food is gone, but what kind of birds are eating it? You might have a case of the FOMOAC: Fatigue of Missing Outdoors in Air Conditioning. With a stone or tile patio or porch for your Florida Home, you can still enjoy those legendarily gorgeous Florida nights. Find your outdoor dream tile at K&S Wholesale Tile before you miss out on that sneaky squirrel jackin’ your bird feed. Adding tile walls or stone half-walls can redefine your Florida outdoor patio or porch. Tile & stone walls for your outdoor space can give your patio or porch an intimate feel & a touch of added privacy. Have you considered adding a colorful mosaic tile for your outside half-walls or spiffy tile pattern to your full outdoor walls? With the right style of tile, you can make your outdoor living space inviting & cozy. catching & glamorous. The variety of colors allow you to put the unique touches of personality to your outdoor space. K&S Wholesale Tile carries the best selection of in-stock & special order outdoor glass mosaic tiling products for your patio or porch outdoor living space in The State of Florida. Why doesn’t K&S Wholesale Tile advertise a lower in-stock price per square foot like competing floor stores? Tile Rating System: How Does It Work? What are the differences between tile types (wall, floor & outdoor tiles)? How do I measure my area to tile? How much tile do I need? Wholesale Tile Showroom Warehouse stone, glass & floor selection sold at the lowest prices. Already know the Tile you want? Want to be a part of the Awesome of K&S Tile? Find out what K&S is doing for our Tampa Bay community.